Seven disconnected items I need to get out of my head. Or: Women, the Law & Literature. Have I mentioned lately how awesome Hadley Arkes is? Among his many other accomplishments, he's the head of The Center for the Jurisprudence of Natural Law, which has a brand spankin' new website, Right Reason, which you should definitely bookmark or add to your reader or whatever. Drawing on the formula of Wickard, I offered this construction: that singular, private abortion may be yours and yours alone, but when it is taken together to form an aggregate of 1.3-1.5 million abortions every year, it is having the most pronounced effect on the interstate market for baby food, diapers, bassinets, tuitions in schools, weddings, to say nothing of 1.3 million new taxpayers coming on every year to help fund Social Security and Medicare.I'd submit to a candid world that this argument fits not only plausibly, but compellingly, under the frame of the arguments we've heard under the Commerce Clause and Wickard v. Filburn. But of course we know that this argument would not stand a chance of succeeding. Of course it went without saying that the managers of the Super Bowl last month would not be putting on Mozart quartets. These entertainments of late have not exactly been refined, and it may take a sensibility truly exquisite to know when a Madonna crosses a line into vulgarity. 4. I've recently discovered and been enjoying Donald Sensing's blog, Sense of Events. See for example this post: Women's health care and the sexual objectification of women. 5. Slightly connected to that: My spy in the field of journalism was speaking with someone about how gross Bill Maher is, and this person described being on Maher's show and being treated well. Said person also described being at a dinner Maher hosted which was something like a salon, with astrophysicists and extraordinarily accomplished people in other fields in attendance. Said Guest got to talking to Maher's date, and happened to ask her what she did for a living. "I'm Miss June," she said, in a "Don't you know who I am?" sort of tone. Said Guest actually didn't know what she meant and she had to explain it to him. But that was it: her sole accomplishment, and she was as proud of it as if she'd been an astrophysicist. I am trying to wrap my mind around that. Taking your clothes off for money I understand (though don't condone, which I hope needn't be explained, but seeing as it's the internet...). As your talent for which you expect respect? See item #3. 7. A provocative and important article on divorce: we're making it too scary. Enough fear. What's needed is hope. 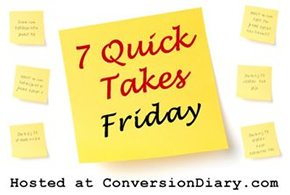 Visit conversiondiary.com for more quick takes.